Renee Thompson interviews Jonathon Israel, Rod Bruce, Eddie Lebranda, and Christine Bilbrey from The Florida Bar’s Practice Resource Institute (PRI). Intro: Welcome to the official Florida Bar Podcast where we cover Practice Management, Leadership, and what’s happening in Florida Law, brought to you by The Florida Bar Practice Resource Institute. You are listening to Legal Talk Network. Renee Thompson: Hello and welcome to The Florida Bar Podcast Channel! This is Renee Thompson and I am your host today for the show being recorded at the 2016 Annual Florida Bar Convention. We are here on location at the beautiful Hilton Orlando Bonnet Creek Resort. We are here to cover this event and its highlights for you and all of our listeners. Joining me today, we have a powerhouse panel. So I want to go ahead and introduce first, Jonathon, if you will tell our listeners, not only what you do, but a little bit about your background. Jonathon Israel: Sure! I am the Director of The Florida Bar’s Practice Resource Institute. So we are the practice management assistant service of Florida Bar and for our membership. We provide guidance and assistance with members running their solo small firms, or firms of any size actually, we don’t discriminate there. So any questions you may have about trust accounting, new technology you are looking to implement, starting a practice, closing down your practice, we are here to help you out. Renee Thompson: Great! Thanks Jonathon. Who else do we have here today? Rod Bruce: Hi! My name is Rod Bruce. I am one of the Practice Management Advisors for the PRI. I have a background of almost 20 years in legal experience working as an administrator and paralegal, so I think I bring a lot to the table, hopefully, and help a lot of the attorneys. Renee Thompson: Thank you! Thank you for being here this morning! Eddie! Eddie Lebranda: Hi! Good morning! My name is Eddie Lebranda. I support the Career Center. I consult and advise employers as to how to best promote open positions, as well as hiring opportunities, as well as assist with jobseekers on how to navigate the Career Center site in hopes to finding their next position. Renee Thompson: Great! Thank you for being here, Christine! Christine Bilbrey: Thank you! I am Christine Bilbrey. I am one of the Practice Management Advisors at the Practice Resource Institute. I have been with the Bar for a year. Previously I was a Law Firm Administrator at several law firms in my hometown Pensacola, and now we are here, as Rod and Jonathon said, as a free resource for all of our members to reach out, anything to do with managing their practice, we are happy to help them with. Renee Thompson: Great! And let’s talk a little bit about the Practice Resource Institute. As our membership, they know this was a brainchild of our immediate past President Greg Coleman, who came in to talk about what we could be doing for our members to bring them into the new marketplace and what assistance they may need to make those transitions. And one of the things that I think is so timely and helpful to our membership is that you are all web-based as well. So Jonathon, tell us a little bit about the website that the PRI folks utilize and what they can find on that site? Jonathon Israel: Sure! So the website is really the place we want everybody to go for their questions and answers that they need. On the website we have a lot of great tools and resources. We have got administrative forms to help you run your practice. Renee Thompson: Now, when you say administrative forms, tell me what you mean by that? Jonathon Israel: Client intake forms, client letters, fee agreements. Renee Thompson: Okay. So if I am a practitioner in Florida and I want to bring a new client in, I could utilize these forms to help me do that? Jonathon Israel: Exactly! They are there set up as a template. You just download it and customize it to fit your needs. Renee Thompson: Great! Great! What else will we find on there? Jonathon Israel: Our Florida Bar Podcast is located front and center for everybody to listen to on the latest news that we have coming through there. Renee Thompson: And we love that. Jonathon Israel: We do. We try and keep up with CLEs on there, so we have got over 50 hours of free CLE credits available through our website, covering everything from ethics, to just general CLE credits, and hopefully if this new technology requirement comes through, it will be the place to go to, to find your technology CLEs as well. Renee Thompson: And that’s a really interesting point to our membership, because up until this point we have not had a mandatory CLE requirement for technology, correct? Renee Thompson: Okay. Can you tell us a little bit about what that would require if the Court may institute it? Jonathon Israel: So we are looking to require 3 hours of technology CLE credit when it gets passed. There is no set structure yet as to what the requirement would need, I guess. So we are helping to build that curriculum now and figure out what’s going to be the best technology information to get out there for our members and help them run their practice. Well, one thing I was so impressed with about with regard to PRI is that you seem to offer all of these resources for free. Renee Thompson: That is the part that blew me away. I mean, here we are talking about more CLE and I am sure people who are listening to this podcast are thinking, oh gracious, it’s going to cost me more money, but honestly, there are so many opportunities online. It appears that way. Jonathon Israel: Right! That’s our main focus is really driving home that we are a free resource, truly a member benefit of our membership. Renee Thompson: Great! Well, Christina, I would like to hear what Practice Management Advisors do? I assume you all are the folks behind the chat pracs on the website, or are you the ones taking the calls? I mean tell me what you do? Christine Bilbrey: That’s right! So they can reach us a lot of different ways, and we love getting the chats all the times. If you find yourself in a text conversation, eventually you just want to talk to a live voice. So a lot of times they will say, can I just call you, because they feel like they have a very special problem that they want to explain in detail? We love that. Renee Thompson: Tell us some of the questions you receive on a daily basis? Christine Bilbrey: Oh, okay. Well, we have — there’s been a real focus on two things; brand-new law graduates that have not found a job, so they want to set up their own law firm, so we have been really trying to help them. Christine Bilbrey: And we are filming a new CLE called Starting a New Practice. We have a great checklist to walk them through all the little details to really get them thinking about every part of opening a new business and obviously, specifically for a law firm, the trust account resources comes up for everyone, especially when it’s time for them to pay their Bar dues. They want to make sure they are doing it right. And then the new thing, and this has been going on for a while, all the baby boomers that are starting to retire, so they want to know how to wrap up their practice, succession planning. There’s things that only come up maybe once or twice in your whole career, so it’s not like they know exactly what to do. So we are there with our checklists or resources and it’s all free. Renee Thompson: So that’s an incredible service that you provide to the Florida Bar membership, and one of the things that I was just so impressed with by your team is you are everywhere. I mean, here at the convention, I saw the awesome exhibit booth you all are having, but I see you at other events too, whether it be Winter Meeting, whether it be the General Meeting. I mean, I am so impressed with how you all have really gotten out into our membership to let them know about the resources that are available. Eddie, tell us a little bit about what you do from the career side of things? Eddie Lebranda: Absolutely! So I support the Career Center side of it, and as far as the website goes, we actually have a brand-new upgraded site that was launched last week, which provides new capabilities such as mobile optimization. So now our registered users will have the capability to access new job opportunities through mobile optimization. Renee Thompson: That’s interesting you mention it, because not long ago I saw an advertisement for a career fair that was done online. Is that something that falls under your umbrella? Renee Thompson: I mean, it’s a very impressive way to do interviewing. I was very impressed with what you all were doing. Eddie Lebranda: Absolutely! And I think we continue to explore these other channels on how to connect and deliver job openings. So with this new website, it’s a cleaner feel, and it’s a little easier to navigate through, and I myself as the advisor and consultant for both employers and jobseekers, it definitely makes it a little bit easier to do you job as someone who would advertise their job opening. Renee Thompson: So tell us when you do these career fairs, the online career fairs, if I am a law student or a young lawyer looking to transition, or even a person who has more experience, who wants to be a part of it, what is the process to go about being a part of them; we just go to the PRI site? Eddie Lebranda: You go to the PRI site and there will be an announcement or typically there will be a marketing or some sort of email blast inviting people to — or attendees to participate in this. So we can consult with the — I am not sure who would be the point of contact to inquire about this. Who would be in the office to consult with that? Rod Bruce: It would be anybody in our department that can do it. And I think, as Eddie was saying, we have had really good success with our first group. Renee Thompson: It looked amazing! I mean, it seemed like you had national employers who were looking for folks, whether it’s in the State of Florida or otherwise, who frankly you may not have an opportunity to see all in one place. I mean, it was just a very streamline way to use technology to find potential employers and have them find you. It was kind of like Match.com, but for employers. Eddie Lebranda: That’s what we tend to say sometimes when everybody asks, we tell people that. And the thing is that time is very important in your practice and to find the best candidate out there, this is definitely a very convenient channel to meet potential candidates. Renee Thompson: I enjoyed too how when you all solicited for that, you had the opportunity to tell a little bit about yourself, more than just a resume. So, I guess that it was just a new way to do the interview process whereas you might have to shlep from law firm to law firm to find all these people; they were all in one place. I thought it was really streamlined. Good job! Eddie Lebranda: Right! Another thing I would add is that with the upgraded Career Center website, we also bring new services like resume critiquing and career counseling as well. Renee Thompson: Oh wonderful! So if I have a resume, I can send it to you all to say, this is working or maybe add some things? Eddie Lebranda: Absolutely! We are definitely a one-stop shop for recruitment, especially when it comes to how to best promote opportunities, and then on the jobseeker side, definitely as far as formatting your resume and how to make sure that it’s properly uploaded and formatted on our new website. Renee Thompson: If you had one tip to give our listeners about their resume, what would it be? Eddie Lebranda: I would definitely say that keep it clean and make sure that your contact information is on there. That is the tiniest detail that you would think that everybody would have on there is their contact information, but not everybody tends to do that. Renee Thompson: Rod, tell us, you are also a Practice Management Advisor, correct? Renee Thompson: Are you one of the folks who is actually on the phone bank or are you a behind-the-scenes person? Rod Bruce: I am definitely on the phone as well. We are of course there for the chat and everything else; email even, if there’s a lot of information that we want to impart to the particular attorney that has questions. We address the individual concerns of the attorneys, each phone call differently, so that way we can make sure that we get the information to them in the best way for them to access the information. Renee Thompson: That’s great! I mean, having Practice Management Advisors on staff is really new for the Florida Bar, so it’s exciting to me to hear how you all are growing in these positions and seeing the resources get to our membership. So tell me Rod, do you see any changes in the upcoming year with PRI things we might be on the lookout, what we might be able to expect? Rod Bruce: Well, of course we are trying to get the information out there that the PRI, the Practice Resource Institute, is there and available for attorneys. So you will see more information about us coming out. We are updating and improving our website. We are sending out olive branches into other departments to spread the word and to help provide more information to the different attorneys that have questions. So you are going to see a lot more PRI. Renee Thompson: And Jonathon, maybe you can tell us, when you all first opened the phone bank, I mean did you sit and wait for the phone to ring, or were folks there right the first day? Jonathon Israel: No, folks were there waiting right there the first day. Renee Thompson: Oh really? Great! Great! I always wondered if it was a slow process for that transition. Jonathon Israel: No, it was a very quick process, the floodgates opened. Renee Thompson: Probably faster than you thought. Now, tell us too, you had spoken about trust accounting, that that was an opportunity for folks. Tell us a little bit about what resources they might find on PRI to learn more about how to do their trust accounts properly? Jonathon Israel: Sure! Well, we have a free CLE called Maintaining a TRUSTworthy Trust Account, that’s available to them, as well as some templates to use in your journals or reconciling your trust account that they can download and use those for free as well. Renee Thompson: Wow! That’s one thing that PRI is really I think exceptional at is it seems to be a very broad scope of the types of resources that a new or a transitioning practitioner may need in their career. So I applaud all of you for the efforts that you are doing! Is there anything that we need to know going into the next year as members about what you hope to see from us, meaning do you want us to be calling you more often? How do you want us to get involved in the resources that you are providing? Jonathon Israel: Definitely reach out to us and let us know how it is that we can best serve you, or if you have anything that you need and want us to help produce to get your practice running a little bit better. As Rod mentioned briefly, we do have a — we are working on our website constantly to get new resources out there, and one of our goals for this year is to kind of update our website, mobile optimize it as Eddie touched on for the Career Center. So basically you will have a Practice Management Advisor in your pocket. You will be able to take it with you and go anywhere. Renee Thompson: I like that! Jonathon Israel: Yeah, be able to — any questions you have while you are on the go, you would be able to reach out and get in touch with us. Renee Thompson: Well, I want to ask you one last question before we wrap this up. I would like to know from each of you, if you had one tip for a practitioner who wanted to utilize something in the Practice Resource Institute, what would you advise them to look at? So if I am a new attorney or I just moved to the State of Florida and I am setting up a practice, what tip or where would you send them in your advice? And I will start with Christine. Christine Bilbrey: I think that not enough of the members realize how many free benefits they are getting when they pay their Bar dues. So we have got — if you want to set up a new practice, you can incorporate for free through the Bar. You can get free legal research through the Bar with Fastcase. We have so many discounts on technology. Jonathon continues to research new practice management software, and most of those benefits are lifetime discounts on that technology. Mr. Harkness has encouraged us to write more articles, so you are going to see more information coming out. And that prompts every time we have another article out in the journal or the news, we get a peak in our phone calls, because it makes people really think about things that they may have overlooked, even if they have been in practice for a while. Renee Thompson: Great! And what about you, Eddie? Eddie Lebranda: Definitely visit The Florida Bar Career Center, and if you are a jobseeker I would highly encourage checking our brand-new website and sign up for a job alert. We do have an incredible platform on how to deliver brand-new and current jobs to your mobile, and so if you want to stay on top of what’s available out in the market, we do have those tools and resources on how to best promote for employers in any job openings. Renee Thompson: Great! And what about you, Rod? Rod Bruce: I would say take a moment when you have some time; everybody has a few moments when they can just go and surf, so go to our website, look around and see, because there is a wealth of information there that can hit on a number of different points that you may not think about at the moment, but you realize later on that’s something that I can research. And another good thing too for an attorney, we also have seen an uptick in attorneys transitioning, going from a medium to a large firm, and they are going out on their own practice. So there is a lot of information that we have that can even help them to help make that transition, because there are so many small details that is handled by an administrator or an accountant that the attorneys are going to have to deal with themselves, and we can help them make those changes, make those choices that they need to. Renee Thompson: That’s great! Having a back office, it’s really important, I love that about PRI. And Jonathon, what about you? Jonathon Israel: Definitely come to our website. We have the focus area, Starting a New Practice, which has everything outlined for you to help you get started down that road of creating your practice or opening up a new firm. Renee Thompson: And can you tell our listeners what that website address is? Jonathon Israel: It’s HYPERLINK “http://www.floridabar.org/pri” www.floridabar.org/pri. Renee Thompson: Great! Well, it looks like we have reached the end of our programming today and I want to thank you all so much, Jonathon, Rod, Eddie, Christine for being here today! Our listeners, if they have questions and want to follow up with you, how will they go about reaching you? Jonathon Israel: They can email us at HYPERLINK “mailto:[email protected]” [email protected] or they can call us at 1-866-730-2020. 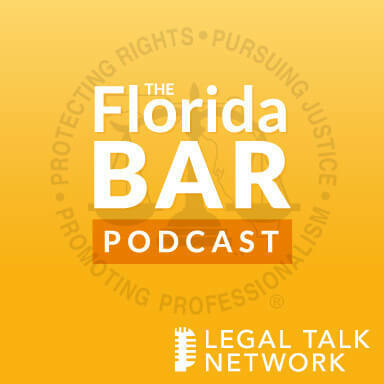 Renee Thompson: This has been another edition of The Florida Bar Podcast Channel. I am Renee Thompson. You can find me at Upchurch, Watson, White Mediation Group or on Twitter @legallyrenee. Signing off today from Orlando, Florida, until next time! Thank you for listening! Join host Adriana Linares for her next podcast on Practice Management, Leadership, and what’s happening in Florida Law.